The much loved Spanish bridal house have just released their new collection and I want you Bijou girls to see it first. 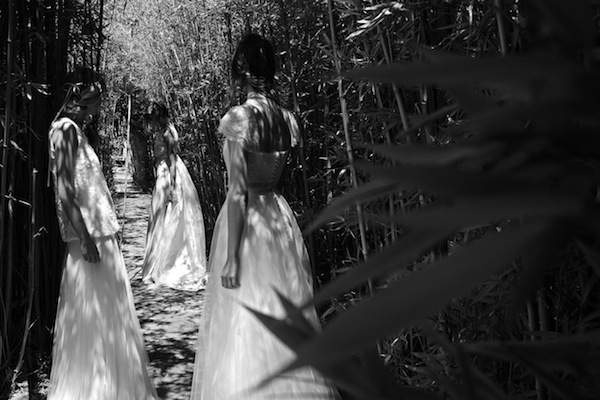 The Jesus Peiro 2015 Perfume collection contains a whopping 90 wedding dresses which are just too much for me to feature here but I do have the dreamy fashion campaign for us to get lost in. Designer Merche Segarra took inspiration from “the delicacy, individuality and uniqueness of a fragrance.” Being inspired by perfume meant also creating a signature ‘Jesus Peiro’ scent, something new for the bridal brand celebrating its 26th birthday. Designed with the Jesus Peiro bride in mind, famed perfumer Daniel Joiser combined fresh citric notes, sweet caramel and sparkling musk to make an elegant and contemporary perfume. This latest collection recognises the current trend for soft, smooth and romantic bridal silhouettes. There’s a touch of the bohemian here but the styles are fresh. After 2014’s popularity for colour we’re moving back to the traditional shades of ivory but as the Jesus Peiro collection highlights we still want delicate mother-of-pearl, grey and gold embroideries and embellishments.